Marly teaches three Craftsy classes and two workshops at this time. These classes are fun, informative and best of all they never expire! Take a look at Marly’s classes and sign up for one or all 🙂 If you want to listen to some of her podcasts with other Craftsy instructors or read her reviews of a Craftsy class take a look here! Have you ever set out to crochet a sweater, spent days of work and hundreds of dollars on yarn, only to end up with something you never wear because it just looks wrong? Marly Bird to the rescue!In Curvy Crochet, you’ll select the perfect pattern for your shape, and make easy fit adjustments to bust, sleeves, neckline and other trouble spots. You’ll discover the luxurious yarns that make great plus-size clothes, and the ones that spell disaster every time. And you’ll learn how to transform swatching from a tedious task into a valuable tool. You’ll use your favorite sweater, right out of your closet, to tell you things you never knew about yourself. And you’ll make your very own custom dress form … from duct tape! Get advice and help from Marly as you learn the same techniques designers use for a perfect fit and finish every time. Marly’s energy and humor makes it all fun! Sign up today for Curvy Crochet. Take control of your wardrobe and create beautiful things you’ll wear with pride! Use this link to sign up! Have you ever spent time and yarn money to knit a sweater that you never wear because it stretched, or feels funny, or makes you look massive? Designer and plus-size lady Marly Bird feels your pain.In Curvy Knits: Plus-Size Knitwear,you’ll select the perfect pattern for your shape, and make easy fit adjustments to bust, sleeves, neckline and other trouble spots. You’ll discover delicious yarns that make great plus-size clothes, and the ones that fail every time. And you’ll learn how to transform swatching from a boring chore into a valuable tool. You’ll use your favorite sweater, right out of your closet, to tell you things you never knew about yourself. And you’ll make your very own custom-made dress form … from duct tape! Get advice and help from Marly as you learn the same techniques knitwear designers use for a perfect fit and finish every time. Sign up today for Curvy Knits. Take control of your wardrobe and create beautiful things you’ll wear with pride! Use this link to sign up! Cold hands? Warm them up with the perfect portable knitting project. Instructor Marly Bird begins with a simple yet versatile pattern that will put you in mittens or gloves in no time. You’ll learn how to cast on with double-pointed needles and knit in the round fearlessly. Change up the pattern and make fingerless gloves, mitts or even convertible mittens (texting, anyone?). When you’re ready to fancy up your fingers, try mittens with an elegant lacy cuff, clever cables or faux Fair Isle. Or go for super-cozy by lining your mittens with fleecy tufts called thrums. As a bonus, you’ll also learn to knit a lining for your mitts or mittens and how to use duplicate stitch to personalize your project with letters or numbers. Whether you want to warm your own paws or warm others’ hearts with a handmade gift, Mittens & Gloves Galore can give you a hand. So sign up today! Use this link to sign up today! Join the Craftsy Mystery Crochet-Along and gain access to instructor Marly Bird’s exclusive hat project! Ideal for fun, homemade holiday gifts, the basic hat design can be worked up quickly and embellished with chic crocheted flowers for a stylish addition. Each workshop includes 3 skeins (66 yards each) of Schachenmayr Boston Style yarn in your color choice to complete one hat project. Bright and warm, this yarn handles easily as you work up Marly Bird’s exclusive pattern during Craftsy’s November Crochet-Along! The workshop includes the pattern, along with in-depth instructions and high quality close-up photos of each step. Yarn will be delivered to you by November 1st, when your workshop access is activated on Craftsy and the surprise is revealed. Plus, Marly will be responding to questions and providing help along the way. With her guidance, beginner and above knitters will be able to participate in and enjoy the workshop. Won’t you join the fun? Learn some new crocheting techniques with this warm winter project from Marly Bird! Sign Up Today! Entrelac is experiencing a resurgence in the knitting world. With a unique fabric, endless color combination possibilities and the spectacular yarns on the market, now is the perfect time to learn this technique. The Knit Entrelac Beanie Workshop not only gives you instruction to make a MUST HAVE hat that all your friends will want, but with this fantastic workshop you learn how to do basic entrelac, how to do jogless color work, how to knit backwards making it unnecessary to purl and how to do entrelac in the round. What more could you want? All instructions are coupled with a photo tutorial making it perfect for left or right brained learners alike. If you have any questions along the way, I’m here to help! Post questions, comments, and photos of your work to share with me and your fellow students. 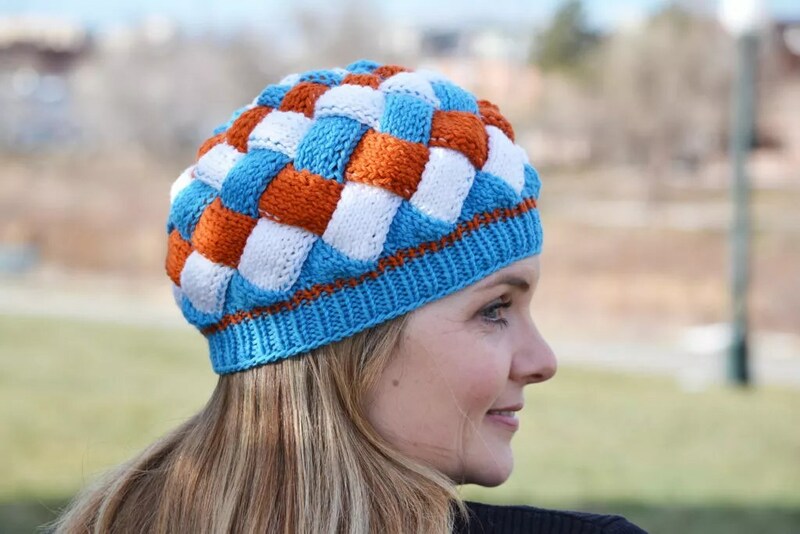 Make the Knit Entrelac Beanie for every member in your family! Sign Up Today!